Small-scale systems with their with short supply chains run at the highest efficiency, but are largely ignored by support schemes. Such systems can offer opportunities for new entrants, but finding such opportunities can be a major challenge. This block of workshops addressed these key questions. 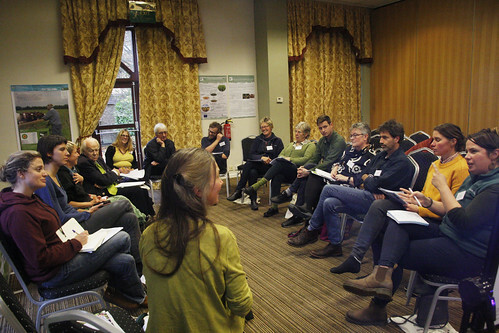 The session explored how we might work collectively to make a case for Government recognition of, and support for, small-scale production and short supply-chains – so that Government understands that it is a key means of ensuring access for people to healthy food and the value of supplying directly to the public. The opportunities to shape public policy to encourage new entrants who often come into the industry through small-scale farms) into farming and ensure access to land/start-up costs/advice on business plans/training schemes were discussed. Scotland’s practice of giving £70k to new farming entrants is underpinned by Scottish policy which perceives encouraging new entrants as contributing to the wider public good. The Ecological Land Cooperative and County Farms are two mechanisms to help encourage small-scale farmers to start up. The Organic Acton Plan will explore ways in which to deliver economically resilient small scale farms which have the necessary infrastructure investment - capital grants for farm improvements, marketing and processing grants. The organic sector will continue to question where financial support, which currently comes through the Rural Development Programme, will be drawn from. The session contained a particular focus on the Horticultural campaigns launched this year – New Deal for Horticulture and Horticultural Renewal Programme. There is a need for more fruit and vegetables to be produced in the UK as there is a massive opportunity especially for small-scale and organic producers. It highlighted the work of the Horticultural Roundtable including a focus on developments in Environmental Land Management scheme with a horticultural Test and Trial project. Look to Wales where there has been an emphasis on the public goods of social cohesion and cultural integrity of farming - need to get public onto farms to encourage them to support farms. There is a lot of work being done in Leicester on growing the local food sector – explore for shared learning? Agri–food Industry Skills Strategy to include small scale and short supply chains as part of its overall strategy (Working with the Food and Drink Sector Council through its Agricultural Productivity and Workforce working groups, the skills leadership group aims to deliver a new agriculture and horticulture skills plan within wider Industrial Strategy proposals to accelerate growth across the Agri-Food Chain. In the context of aging farmers (average age 60 years) and only 2.9% of UK land certified organic, how do we encourage new entrants? Who will be feeding us in 20 years’ time? What is stopping you? 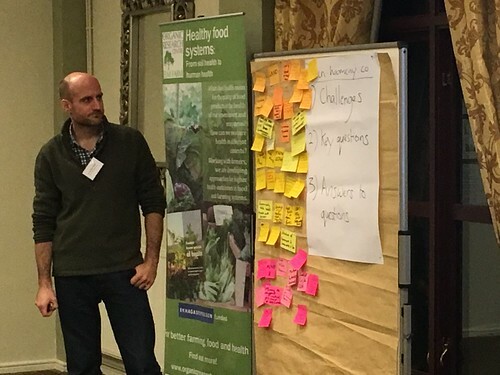 The session considered three areas that need to be addressed by new entrants to organic – access to land, knowledge and money from different perspectives. OGA’s Kate Collyns spoke from personal experience about access to land and funding, many sources were detailed in her slides, including Future Farmers, a Guide to Running Training Schemes on Farms. Kai Lange shared 30 years’ experience at the Biodynamic Agricultural College focused on practical training to address entrants’ needs and approaches to practical learning. Laurence Smith (ORC) addressed academic courses (BSc, MSc, PhD), outlining various providers and funding. Obtain funding for a digital ‘hub’ or entry point to be developed & managed all different data sources giving information and advice on these topics. Object to 7-year one-off payment without any constraints on use as potentially providing immediate cash inputs which may be used short term with no long-term provision being made. Organic certification costs are a large overhead for small producers, a free or reduced rate would be helpful.